Much to the relief of risk-averse preferred stock buyers, the market prices of high quality preferred stocks finally came down during mid-March. Prior to March 13 there were only four high quality preferred stocks available on U.S. stock exchanges for a market price below $25 (their "par" value). That number has now risen to sixteen, providing substantially more choices to preferred stock buyers (see the Special Announcement article below for a list of this month's sub-$25 bargains and the definition of what makes a "high quality" preferred stock). 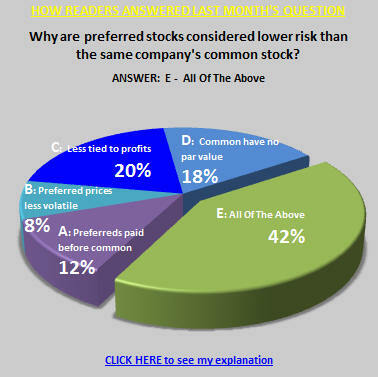 Buying preferred stock shares for less than "par" (usually $25 per share) is important to many preferred stock investors since doing so not only adds a layer of principal protection to your investment but also positions you for a downstream capital gain should the issuing company "call" (buy back from you) your shares. In the event of a call, shareholders receive the par value in cash for each share so purchasing for a price below par becomes important. Figure 1 illustrates the squeeze that steadily increasing market prices for high quality preferred stocks had put on buyers during most of the first quarter. As market prices increased, the number of high quality issues available for less than $25 per share had steadily fallen, leaving many preferred stock buyers with few choices. In an unusual alignment of events, a large group of preferred stock shareholders were simultaneously pushed into the market as buyers during the first quarter. 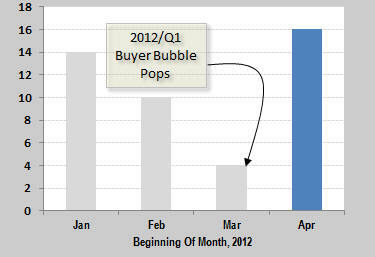 As last month's issue of the CDx3 Newsletter explained, this "buyer bubble" was caused by our current low interest rate environment. Several companies have taken advantage of today's low rates by issuing a bumper crop of new lower rate preferred stocks and are using the proceeds from these new preferred stocks to call their older, more expensive issues. 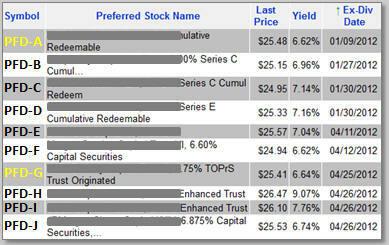 Eleven widely held, high quality preferred stocks were called during the first quarter of 2012. Holders of the retired preferreds suddenly and simultaneously became motivated buyers looking to replace their newly called shares. 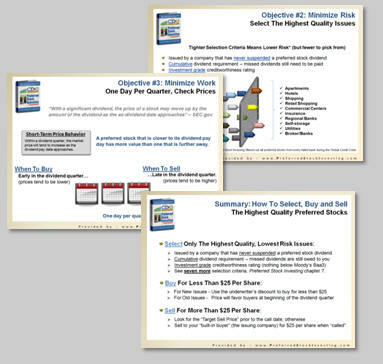 The resulting "buyer bubble" pushed the number of high quality preferred stock issues available for a market price below $25 down to a scant four alternatives as illustrated in Figure 1. But as the mid-March ex-dividend dates arrived, many shorter-term investors sold their shares, having collected the Q1 dividend cash. Because shorter-term preferred stock investors were driving the market, prices fell just after the mid-March ex-dividend dates passed. On March 13 the list of high quality preferred stocks available for less than $25 jumped from four to sixteen, creating several new opportunities for buyers. Could April Bring Bargains For Buyers? The passing of the mid-March ex-dividend dates of high quality preferred stocks led shorter-term shareholders to sell, pushing market prices down during the days that followed. That created sixteen great buying opportunities for preferred stock investors, so it is worth taking a look at what may be in store for April. While it is not possible to know with certainty what the future market price of a preferred stock will be, there are some interesting indicators that savvy preferred stock buyers should be paying attention to. As I am about to explain, it appears that the shorter-term investors that created March's buying opportunities are still driving. Consequently, April is looking very much like a repeat of March where buyers will be treated to sub-$25 market prices for certain high quality preferred stocks in the days following April ex-dividend dates. When longer-term preferred stock investors are buying, the average market price of the preferred stocks that they are purchasing will tend to climb by more than one quarter's worth of dividend income above par. It is not unusual to see long-term buyers pay two, three or even four quarters worth of dividend income above par ($25) since they are in it for the long haul and believe, for whatever reason, that a call is very unlikely for the foreseeable future. But the opposite is also true if shorter-term investors take over as we saw happen during March. In that event, the market price of a preferred stock will tend to stay closer to only one quarter's worth of dividend income above $25. Generally, the closer the market price of a high quality preferred stock is to $25 plus one quarter's worth of dividend income, the more control shorter-term investors are exerting over longer-term investors. 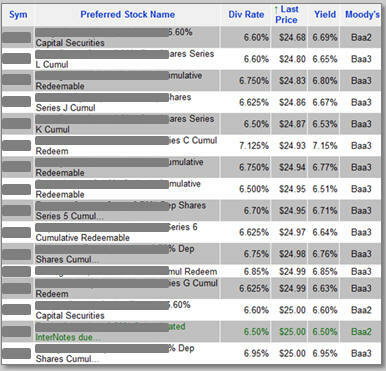 Figure 2 lists the ten high quality preferred stocks that will have April 2012 ex-dividend dates. This list is sorted by the Ex-Div Date column (note that the issuing companies of the first four on the list have yet to declare their April dividends but are expected to do so within the next few days). These are the preferred stocks that buyers should be watching as April unfolds. 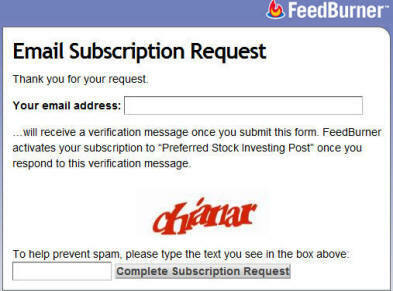 Note that in order to protect the values of subscriptions to the CDx3 Notification Service (my preferred stock email alert and research newsletter service) trading symbols are obscured here. 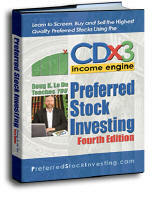 If you are already a subscriber to the CDx3 Notification Service click the "Ex-Div This Month" HotList link on the CDx3 Notification Service website for a list of the high quality preferred stocks with April ex-dividend dates and current prices. The average quarterly dividend paid by the high quality preferred stocks on this April list is $0.46 per share. The average market price: $25.49. Shorter-term preferred stock investors are still driving the April market for high quality preferred stocks, just like they were during March. Take a look at PFD-A in Figure 2. This high quality preferred stock will pay a quarterly dividend of $0.42 to those holding shares on or about April 9, just a few days from now. On March 30 when this data was gathered, PFD-A was selling for $25.48 implying that shorter-term investors, who are only planning on continuing to hold their shares until they can collect one more quarter's dividend a few days from now, have more control than longer-term investors. PFD-G presents another example. This high quality preferred stock reaches its ex-dividend a bit later in April (April 25) and also pays a $0.42 per share dividend. If longer-term investor were driving here we would see PFD-G's market price closer to $25.84 or so (two quarter's worth of dividend income above par). But with three weeks to go before its April 25 ex-dividend date, shorter-term investors are holding the price at $25.41 (one quarter's worth of dividend income above par). So when we see the market price of a group of high quality preferred stocks with an approaching ex-dividend date start to approach one quarter's worth of dividend above par, a sell-off may be in the making just after the ex-dividend dates pass by. Just like what happened in a big way during March. There is no way to know for sure what these prices will do as April unfolds, but savvy preferred stock buyers should be looking for sub-$25 buying opportunities as we pass the ex-dividend dates seen in Figure 2. (Already a subscriber? 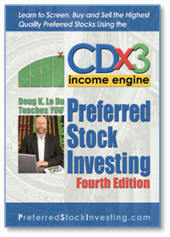 For a list of these 16 high quality preferred stocks see page 6 of the April issue of CDx3 Research Notes). (Already a subscriber? For a list of the high quality preferred stocks with April ex-dividend dates and current prices, click the "Ex-Div This Month" HotList link on the CDx3 Notification Service website). There are about 1,000 preferred stocks trading on U.S. stock exchanges. Of these, there are sixteen specific issues that are of particular interest this month (up from four last month). Not only are these the highest quality preferred stocks available (defined below) but they are providing an average annual dividend yield of 6.71% right now. A special note this month: On March 18, 2012 we added a new type of fixed-income security to the CDx3 Notification Service database - Exchange Traded Debt Securities. ETDS are extremely similar to preferred stocks and are often listed as such by brokerage systems but they are actually lower-risk bonds (ETDS shareholders have seniority over the same company's preferred stock shareholders). ETDS's are shown in green font in our database and this month's bargain table provides our first example. The declaration date (date that the issuing company declares the record date), ex-dividend date (set by the stock exchange) and record date (set by the issuing company) occur prior to the actual dividend payment. The payment schedule for dividends throughout the year is specified in the issue's prospectus. For a preferred stock that pays quarterly dividends there will be four payment dates listed (usually in the prospectus section titled "Dividends" or "Distributions"). The issuing company can liquidate (buy back from you) your shares in two ways: (1) by retiring ("calling") the shares on or after the published call date (which usually occurs five years after the date that the preferred stock is first issued to the marketplace) or (2) allowing the security to reach its maturity date without having previously been called. In either event, the issuing company will liquidate your shares for a price equal to the liquidation preference amount as published in the prospectus.